Description: A sober off white card has a combination of gold and pearl printed design in the background with multicolor bindis pasted on it. In the centre is cream design printed in a rectangular box with gold bindis pasted on it. 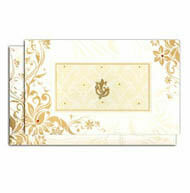 Inserts are available in multicolor choices while envelope is made of same off white card.